The Achieving TABE Success family is designed to provide complete skill preparation and practice for TABE 9&10, encompassing Reading, Mathematics, and Language, for levels E, M, D and A. This series of books will help students achieve NRA gain through targeted instruction that specifically addresses TABE 9&10 skills. 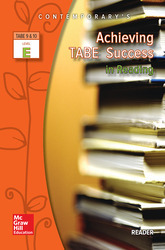 Achieving TABE Success in Reading ... Readers are coordinated with their respective Reading workbooks, to strengthen skills by applying examples and questions that are pertinent to the skill covered in the workbook.